'The PHARE' is his name. Classified 3 stars. Charming apartment with a neat decoration in the marine atmosphere, a good quality, clean and bright, recently restored, the first and only floor of a charming small building without opposite, it enjoys a privileged location in heart of the Cotinière (commune of Saint Pierre d'Oléron), in the immediate vicinity of the town center and these trade, markets, the beach and the small fishing port very popular of the Cotinière, all is in less than 5 minutes on foot. - A modern and equipped kitchen, open on the sitting area and the dining room. It has a silent dishwasher, an electric oven cold door, a microwave oven, a hood, a toaster, a regular filter coffee maker and a coffee maker. Senseo pods, a citrus juicer, a kettle, a fridge and pretty crockery. - A common basket of basic necessities is left available, including oil, vinegar, salt, pepper, sugar, coffee filters, and tea. - We leave behind household products: organic dishwashing liquid, a sponge, organic dishwasher tablets, a cloth, floor and window cleaner bio, and garbage bags. - This rental also has a washing machine, iron and ironing board, and a vacuum cleaner. -Final cleaning not included, optional cleaning fee on request 50 euros. - A sitting area with sofa and leatherette armchair, a large HD color television, flat screen 81 cm, which enjoys excellent satellite reception. - A master bedroom with a double bed with excellent sleeping 140 x 200, second small flat screen color television. - And a second cabin room with two twin beds bunk with bed 90x200, the top bed is not recommended for a child under 6 years. We provide duvets and pillows, but bed linen is NOT provided. Possible to rent bed linen on reservation: Bed linen 15 euros per bed per stay. - Charming bathroom with toilet, equipped with a shower with thermostatic tap, as well as a hair dryer and a magnifying mirror. Possibility to rent towels: Bathroom linen, 10 euros per person and per stay. -You have the possibility to park your bikes in the entrance of the apartment, or to hang them in the common parts of the building, it remains open to all. - The rental enjoys a very bright and very pleasant South-East exposure. - Free communal parking is located in front of the rental. - Pets are allowed with prior agreement of the owner for 6 euros per night and per animal, to be paid on the spot. - This room can also accommodate 1 baby for free in the parents' room. We put at your disposal a baby kit including: A cot, a high chair, a changing mat, a bath and its bath seat. We do not provide: The sheets, duvets and pillows of the baby. For safety reasons we do not supply the crib mattress that is not suitable for babies. - Arrivals are autonomous and possible day and night. The owner is not present, but the arrival is very well organized. Admission is from 16:00, and departures before 10:00. The owner is not often on site, a "logbook", as well as guide and map of the island are left in the rental to facilitate the stays of travelers. In the "logbook" are summarized, the tips of the rental, as well as emergency numbers in case of problems, the best addresses of the island, etc. Everything is done so that you spend a very good stay and you are serins. This apartment has the label 'Meublé de tourisme 3 étoiles'. This is the guarantee of an announcement in line with reality and an objective evaluation by the Charente-Maritime General Council, which is reassessed every 5 years. It also enjoys the respectable label "Superhost" "Airbnb" for the years 2018, and 2019. Concerned by the future of our planet and our island, our household products are preferably organic, we have installed foamers and water savers on the water inflow of the machines, we favor the appliances to the efficiency class A energy, our bulbs are low consumption, and our power consumption is managed by enclosures. - For large families, we can offer, on the same floor 2 other apartments 2 and 4 people (see offer 'dunes' 592670 and 'pebbles' 684858) on the same site. 79 euros per night, low season. (Minimum 2 nights). 349 euros the week, low season. 759 euros the week, July / August High season. -Reservation booking: 30%, the balance is to pay the day of arrival. -Our prices are inclusive of all charges, except the tourist tax in season 3. 30 € per night payable locally. 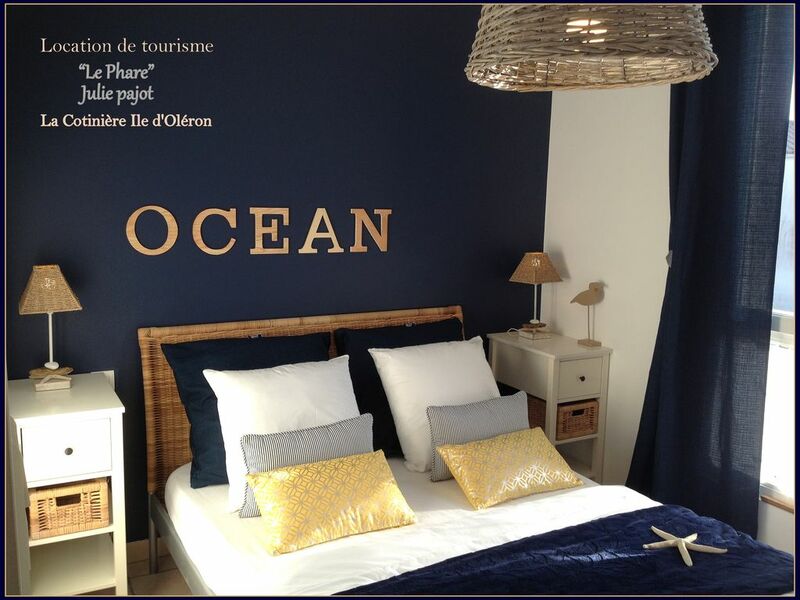 In the heart of the Atlantic, La Cotinière is a village on the west coast of the island of Oleron. ElIe is part of the town of Saint-Pierre-d'Oléron, in the department of Charente-Maritime. The habitat is organized around the port, the first artisanal fishing port of Charente-Maritime, the 7th national port. Some three hundred fishermen work there. The economy is naturally oriented towards maritime activities, fish auction, boat repair workshops, but also tourism. The center of the village is home to many shops: bakeries, bookshop, tobacco shop, butcher, supermarket, restaurant, coiffure, market, bank, tourist office, school, church, etc ... Another symbol is the white and red lighthouse that marks the entrance to the port. La Cotinière has a beach. The climate is oceanic, the winters are mild, The sunshine of the Charente coast is very important. (Timetable given for information only and approximate by car). Closest SNCF train stations: Surgères, La Rochelle, Rochefort, and Saintes (Bus connection to "Saint Pierre d'Oléron", then taxi 4 kms to "La Cotinière"). By boat: Jetty in Saint-Denis d'Oléron Boyardville. The bridge of Ile d'Oleron is free (3km27), it connects the island to the mainland since 1966. Tarifs: 79 euros la nuitée, basse saison. (Minimum 2 nuits). 349 euros la semaine, basse saison. 449 euros la semaine, moyenne saison 749 euros la semaine, juillet/aout Haute saison. -Chèques vacances acceptés. -Arrhes de réservation: 30%, le Solde est à régler le jour d'arrivée. -Nos prix s'entendent toutes charges comprises + taxe de séjour en saison 3.30 € par jour. -Ménage non compris, forfait ménage sur demande 50 euros. -Location possible du linge de maison sur réservation: Linge de lit: 15 euros par lit et par séjour; Linge de toilette: 10 euros par personne et par séjour.